I am very fortunate to have many friends who are talented artists. However, its always difficult to give them gifts because they all have such discerning tastes. So, when an incredibly talented ceramic artist marries an equally talented glass blower, what does one give to them as a wedding gift? After much consideration, I offered Lucie that I would make her wedding cake to celebrate her union to Chad. Luckily, Lucie accepted and was ecstatic! She made no requests as to size, color, theme, etc. She gave me the ultimate carte blanche. I knew I wanted to make a cake that reflected their interests and loves. I decided to do a wooded outdoorsy cake, as Lucie and Chad had decided to marry on their property. They own many acres in upstate NY and live in an underground home! Did I mention that they are not only talented but also very, very cool. They have an enormous garden where they grow most of their food, a coop full of chickens with quirky personalities, and a beautiful natural swimming hole on their property. They live the life that hipsters in Williamsburg want. To create the wooded outdoorsy cake, I started with the structure. I wanted to, literally, incorporate wood. I took a scrap piece of natural walnut wood and finished it to create the base. I then took a scrap piece of sycamore, finished it, and created the top stand portion. Lucie had requested red velvet cake. I opted for a buttercream frosting knowing that it would hold up better in the summertime heat then cream cheese frosting. I mixed a pale green frosting for the base of the cake. 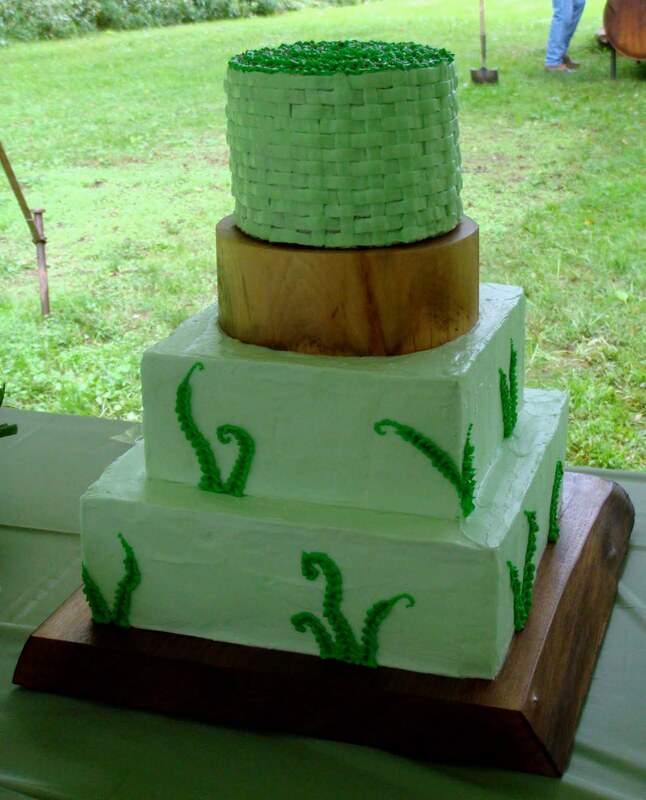 On the bottom two tiers, I piped on ferns. Their property has the most beautiful ferns growing everywhere. For the top tier, I did a basket weave pattern. I thought that it would compliment the country style wedding they were having. When it came time to cut the cake, I lit sparklers and put them on the top the cake, like you would do with candles. That was a big hit with the kids, both young and old! Overall, Lucie and Chad were happy with the cake, which made me happy. The best thing to give artists as a gift, is something you made. They understand and appreciate the labor of love in creating something. Only someone who is a talented artist herself could create something so beautiful (and I imagine very tasty)! Wow, that really was a beautiful cake. Thank you.